Low Voltage Outdoor Lighting To The Rescue! You have put so much thought and effort into your landscape. Do you get to enjoy it enough? Cutting Edge Landscaping designs and installs low voltage landscape lighting in the Eugene, OR area. We would love to work with you! Restraint! Too many lights and your yard will look like a night game at PSU. The idea is highlight focal points in a variety of ways. Up lighting, back lighting, spot lighting, path lights, and even under water lights all have a place. But we will never install even one more light than you need. Quality. Low voltage lighting fixtures from “Big Box” stores can look good- for a little while. However, the plastic parts of these fixtures quickly get brittle and break. The wiring corrodes. The metal oxidizes and looks old. Yes, you will still have a lighting system in 3 years- but it will be ugly. We install quality brass, copper, and steel fixtures with long warranties and great reputations. The brass and copper lights acquire a patina and actually look better with age. LED lights whenever possible. LED bulbs are the way to go. They use very little electricity and last almost forever. Yes, they do add to the initial cost of the system. But they are absolutely a superior product. 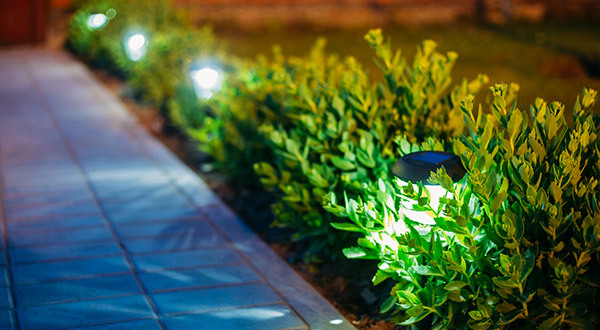 Low voltage lighting systems can be installed by a licensed landscape contractor (including us!) These systems are simple and safe, so no electrician is needed. In fact, many homeowners even install low voltage lights themselves. LED bulbs are now standard. This means landscape lighting is now extremely efficient, with most fixtures using 3-5 watts. And LED bulbs are very long-lasting, so you may never even have to change the bulbs. Use this calculator to find out how much an LED system will save you. Landscape lighting requires minimal digging. So, we can install a system in your mature landscape and not do any damage! Repairs are rarely needed but are simple to tackle when they are.